Easy to Use Products, Inherently Accessible Projects, User Friendly Products, Services and More. Universal design refers to broad-spectrum ideas meant to produce buildings, products, services and environments that are inherently accessible to people; the concept of designing all products and the built environment to be aesthetic and usable to the greatest extent possible by everyone, regardless of their age, ability, or status in life constitutes the main principle of universal design. The Universal Design Award, is open to submission of products, architecture, services and environments which comply with the universal design principles. Nominations are accepted worldwide for both realized and concept stage projects from architects, interior designers, urban designers, product designers and master-planners. Companies and institutions are asked to nominate their accessible and easy to use designs and projects. The A' Design Award for Universal Design is not just an award, it is the indicator of quality and perfection in accessible design, the award is recognized worldwide and takes the attention of design oriented companies, professionals and interest groups around the globe. Winning the A' Universal Design Award is a certificate of excellence for designers, an important milestone in your career. Having the A' Award attracts the eyes of design oriented companies worldwide, winners will be able to find better and higher profile jobs & sales leads, get a step ahead in their life. 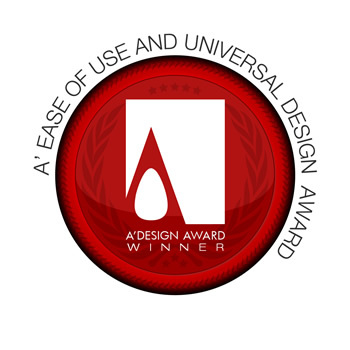 The winners of the A' Ease of Use and Universal Design Award are provided extensive and exclusive marketing and communication services to promote the success of winning the A' Award. Furthermore, the winning designs appear on the A' best designs yearbook which is available worldwide, this book is furthermore distributed to the high-profile magazine editors, design oriented companies and relevant parties. The winning designs are also exhibited at our exhibition in Italy, and the best designs will be picked for the permanent exhibition. The winners appear on magazines, newspapers, webzines and many other publishing mediums. For concept stage projects, the A' Award is an early indicator of success. For realized designs, having the A' Award gives added value to your products and separates them from the rest of commoditized goods, it is an excuse to communicate your product to the media, a reason for press releases. Each winner design receives the trophy, published online and at our best designs book, receives a certificate and sticker templates to be attached to the products, the A' seal of design excellence is also included in the winners package, this seal is valid for the entire product lifecycle without yearly fees. The Universal Design Award Jury is composed of both Academic and Professional participants worldwide, such as chief executive officers or head designers of companies and faculty heads or professors. In addition, the A' Award features the focus group jury, which is composed of ordinary people to normalize the scoring by eliminating the bias on aesthetics and form sections, the votes of Professional, Academic and the Focus Group are weighted to determine the final result. When submitting to the Universal Design Competition keep in mind that your submission will especially be evaluated on the aspect of intiutive operation; if your product is easy to use, easy to learn how to use, and if the instructions or maintainance is easy or not. Therefore, the Universal Design Award applicants shall also submit a PDF presentation regarding why and how the project is easy to use and how it is accessible. The evaluation criteria for the universal design award entries are given the following: ease of use, flexible usability, intuitive operation, safety and error tolerance, intercultural character and economic efficiency. The Aim of the Universal Design Award is to attract the attention of global design media, magazines, and industry leads to your institution by means of creating publicity and dissemination. The Universal design award aims to separate you from the rest of the actors in your industry by honoring your institution with a prestigious award. The universal design award takes once a year. Applications are accepted online from A' Design Award & Competition Website. To apply for the current edition of the Universal Design Award, please click here. The Universal Design Award submission requirements are given at the bottom of this page, please scroll down. Furthermore, please refer to general submission guidelines here. Award winners will be able to use a title that matches their nomination category: Such as "Universal Design Award Winner". View previous period Universal Design Award winners here. Documentation* Max. 40 x A4 Pages PDF Explaining why your product, work or project is better in terms of universal design, how it is more easy to use and how it is more accessible when compared to competing products, works and services. Video File Max. 10 MB. 45 Sec. AVI For products, 3D Rotation View, Conceptual Video, Short Feature or Advertisement of the Product focusing on accessibility, ease of use and universal design principles, for interiors, urban design and architecture, presentation of accessibility elements etc.